Ella Rhodes reports from a joint British Academy / British Psychological Society talk, from Professor Stephen D. Reicher (University of St Andrews). So began Professor Stephen Reicher’s public talk, held at the Royal Society. While many see psychology as the science of the self and the individual, Reicher argued that understanding core psychological concepts was crucial to untangling much larger societal and political phenomena. To understand the rise of Trump, we must re-examine our understanding of the concept of self. Reicher also outlined three models of leadership based on this idea. Egalitarian leaders do not say what it means to be British, for example, but guide a discussion and facilitate the collective enterprise of what it means to be 'us'. Hierarchical leaders appear to dictate what it means to be Chinese, Russian or Indian, etc, and present themselves as the best version of that group identity. Finally, autocratic leaders take it a step further and present themselves as embodying the identity of the group: they appear as the living, breathing epitome of the group, they are the group, and if you question that type of leader, you tend to be portrayed as an out-group member. With all of this in mind, Reicher asked, why did people elect Donald Trump? This has been asked on repeat since his election and many of the narratives write off his supporters as mad or stupid. But projecting what we feel is most salient about Trump onto his supporters is deeply dangerous, Reicher said. For example, Theodore Abel’s 1938 book Why Hitler Came Into Power collected essays from more than 600 Nazi supporters explaining why they voted for Hitler. While some voted because he was anti-Semitic and racist, most didn’t, most voted for him despite that. What is so salient to us about a leader may be less so to those who vote for him. 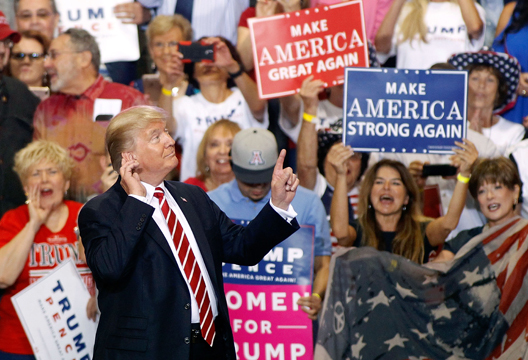 Surveys have shown that even among Trump supporters words such as 'jerk', 'idiot' and 'dumb' are commonly used to describe him, while they don’t dispute the fact he is a racist and sexist. They voted for him regardless. As Reicher pointed out, while his supporters should in the very least have condemned these racist, sexist views, the evidence suggests they voted for him not because of those beliefs, but rather in spite of them. It is also interesting to look at those people who switched sides to vote for Trump. Recent analysis has shown those who switched were mainly 'anti-elites' and those who felt like America was falling behind. Reicher said it was important to consider the world view and demographics of Trump supporters. They tend not to be the poorest, earning on average just over $30,000 per year. They aren’t the least educated and have often completed at least some college education. Reicher said they are the groups who have pulled themselves up, fear sliding back, and feel like they have something to lose. The most important issue for people during the election was whether a leader could bring about change and Trump was seen overwhelmingly as someone who could. Similarly, of two thirds of people surveyed who said they felt America was going in the wrong direction, 69 per cent supported Trump. - Listen to this talk. You can find much more from Professor Reicher in our archive. A transcript / podcast of his appearance for us at Latitude Festival, on 'The rules of unruliness', will be available soon. Also, make sure you read Reicher and Alexander Haslam's prophetic piece on Trump's appeal from Scientific American Mind.